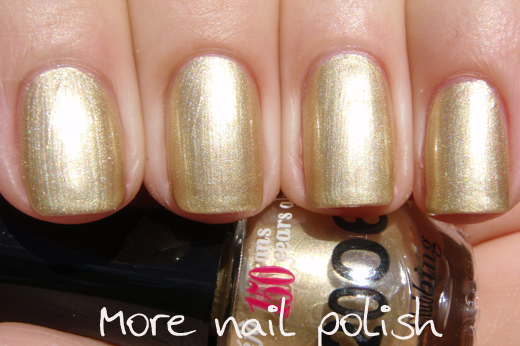 Continuing today to show you the other eight polishes from the Bourjois 150 year anniversary nail collection. Like I said yesterday, these are mini bottles, but you really know they are minis when you can hold all 15 bottles from a collection in your hand! 1956 Le Rouge Fidèle - "The legendary, brilliant and long-lasting Rouge Fidèle lipstick was born." A deep raspberry red. Two coats with Seche Vite. 1980 Boite Ronde - "The year of colour! Little Round Pots made their way onto eyelids with their broad range of colours." I love that they chose a bright intense blue to represent the creation of their eyeshadows. I totally rocked blue shadow in the late 1980s. Yes I'm showing my age now, but I was only a young girl and got to wear makeup because I did ballet. Two coats with Seche Vite. 1995 Grains de beauté - "The Grains de Beauté shower gel line brightened up bathrooms." A pale pink with a sparkling blue shimmer.Two coats with Seche Vite. 2001 Coup de Théâtre - "A new act on the mascara scene: Bourjois invented the first double-ended mascara, Coup de Théâtre!" 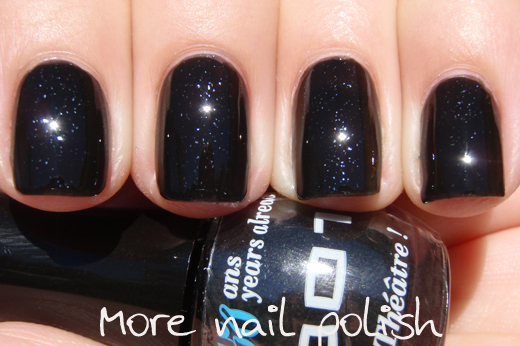 A rich black, with just enough jelly consistency to show the bright silvery blue glass flecks.Two coats with Seche Vite. 2002 Effet 3D lipgloss - "Lips become luscious and shine from a new angle with Effet 3D lipgloss." I'm really loving how they have captured the feel of each milestone so clearly with each shade. 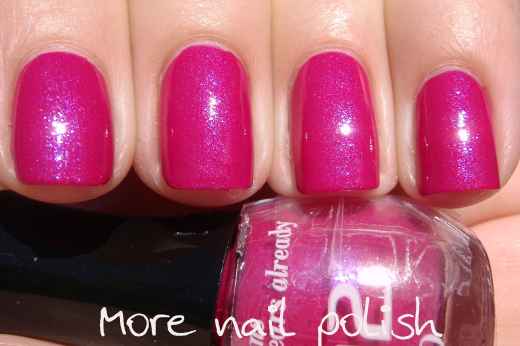 This is a bright fuchsia pink with a blue shimmer. Two coats with Seche Vite. 2006 Clubbing Volume Mascara - "Volume Clubbing Mascara lasts until the end of the night and marks the début of the Clubbing era! A cool toned metallic gold. A bit brushstroaky, but the opacity and cool tones made me forgive that! Two coats with Seche Vite. 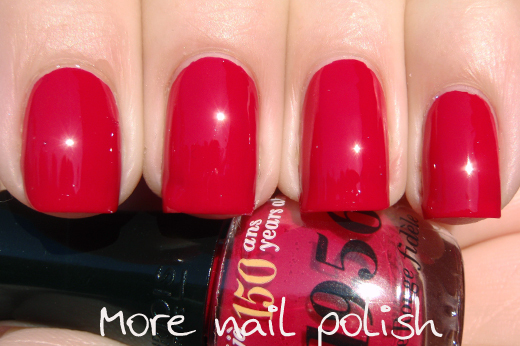 2007 1 Second Nail Enamel - "Bourjois created the 1 Seconde nail enamel: quicker application means more time for fun!" 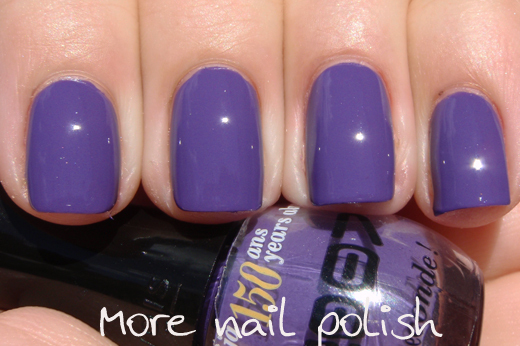 A nail polish inspired by another nail polish. 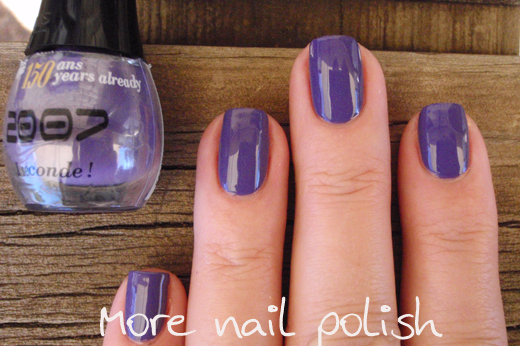 I have one of those 1 second nail enamels, the brush is so wide that you can paint your whole nail in just one wipe. The end of the brush is curved to match your cuticle and I actually quite liked it once I got used to it. 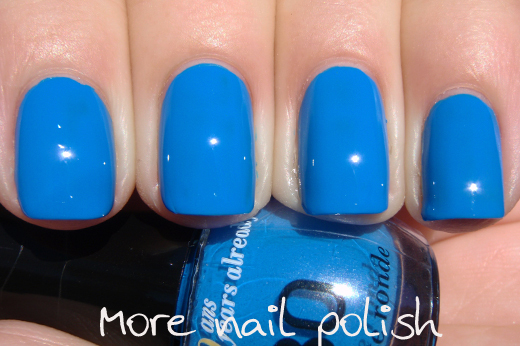 As for this colour - its divine!! Two coats with Seche Vite. 2013 Bon Anniversaire - "150 years old and hasn’t aged a day… Happy birthday Bourjois! - The one and only emblematic Bourjois pink" A bold and richly pigmented magenta pink. Although of course I wish they had releases this colour as a holographic or something for the 150 year polish, but I guess this is an iconic colour for the brand. Two coats with Seche Vite. As I mentioned yesterday, formula = perfection. Bourjois is available in over 100 countries around the world and these polishes will be available this May in Priceline and Target stores in Australia. Australian price is $5 each. Did you notice that I broke a nail and had to file them all down and curve the edges of my nails between the swatches of 1956 and 1980! I wasn't able to get all 15 swatches finished in one day, and that night I broken two corners off my nails on my swatching hand! 2001 Coup de Théâtre looks so good! The rest of the colours don't look that unique but your swatches make it look very desirable. I might have to pop into Priceline very soon! 1980 Boite Ronde is amazing shade, idk why I haven't bought it yet. I like the hot pink and the black one a lot.